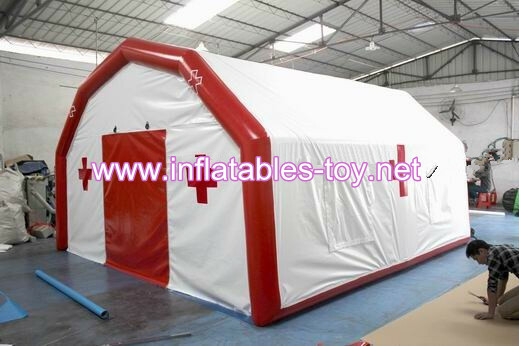 Inflatable relief Pneumatic Tent The tent is supported by air inflatated pole, it can be set up in very short time, normally a 5x5m arena can be set up by one person within 5mins. as for the roof, we make a lot line holder for lights or any Bottle needed when in relief situation. The tent can be seperated into small room when in special situation. 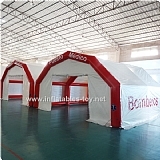 inflatable structure are designed for a short-term and long-term use in many areas, especially in cases with an immediate need for background, but even to accommodate people, to deposit material etc. The tents can be connected among each other and so a bigger interconnected complex can be created, e.g. a field hospital. Feature: Can be made into any shape and any size so it is used in various ways. Installation of lighting effects will be very nice! 1. Size: 10m*6m or Customer made.